Cataracts are hard to see through because they cause clouding of the lens within the eye. 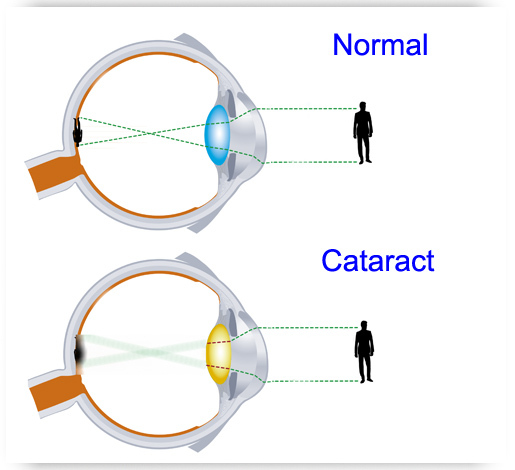 Cataracts most often affect both eyes and causes glare sensitivity and blurred vision. A cataract is a normal part of aging. As we age, the normally clear crystalline lens within our eye can become yellow or opaque. Clinically significant cataracts occurs when the patient is bothered by glare or blurred vision. In the early stages your optometrist will monitor your cataract(s). Often your vision can be improved by making a change in your eyeglass prescription. However, if the cataract progresses and causes your vision to become to blurry a referral to an Ophthalmologist for cataract surgery will be arranged by your Optometrist. To Slow down the formation of cataracts we recommend protection from the sun and a balanced diet. Regular eye examinations by the optometrist to check the health of your eyes.